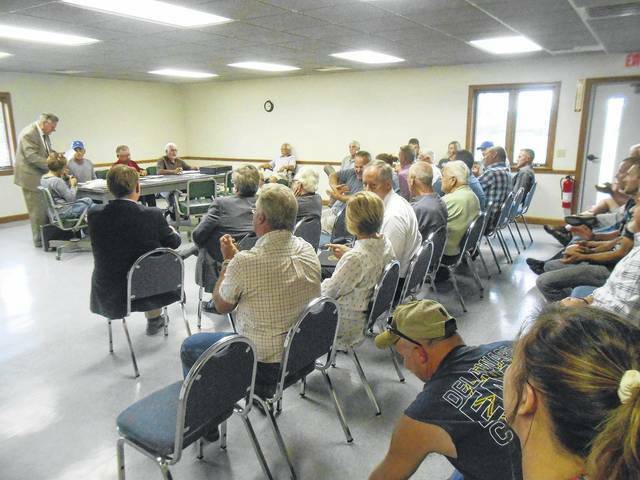 Bennington Township Trustees sign a resolution to designate a revitalization district to the area at Interstate 71 and State Route 61 in the township. This revitalization district would be at the intersection of Interstate 71 and State Route 61. This resolution allows Morrow Meadows Development, Inc. which filed for the resolution, to place an issue on the Nov. 7 ballot to make available D-5 liquor licenses within the district. Morrow County Development Director Shane Farnsworth said having this area designated as a “Revitalization District” will have the potential to bring many more businesses, hotels and restaurants to the area. This summer and last summer the Scholastic Shoot brought more than 20,000 people to the Cardinal Center. This shoot is for youth and they are accompanied by two or more people. Throughout the season there are also competitive shoots of between 250 and 1,000 at Cardinal Center. Most of the people attending these Cardinal Center events have an overnight stay and will be eating in the area. With the two hotels in Morrow County full and with the bed and breakfast businesses booked as well, most must go to Delaware or other places to stay overnight and eat at restaurants or shop out of the area. Farnsworth emphasized that it’s not just keeping more money in Morrow County, but it is the type of hotel and restaurant that can be brought in. The D-5 liquor license is required for the restaurants such as Olive Garden and hotels like Marriott. Presently there are not licenses available to host this type of business, so the investors look to locate in Delaware or Richland counties. It is the hope of the Bennington Trustees, the county commissioners and Farnsworth that having this revitalization district will draw visitors to the county and keep more dollars here. Trustee Enoch Adkins asked Prosecutor Charles Howland how the township can keep some dollars from this development in the township rather than having everything go to the county or state. “There will be several wanting a piece of this pie,” Adkins said. Adkins added that he would like to see the new businesses or facilities share in their own road or driveway maintenance. Howland said he would work toward having the township receive some of the bed tax from hotels. He also thought it would be possible to put into the township zoning code that access roads must be built to ODOT specs. This would make it easier to do maintenance. Farnsworth said that having these hotels and restaurants in the area would bring a “dramatic increase” in the amount of property tax brought in for both the township and county. This resolution and the issue on the ballot are the first steps to bringing business and development to the area. A great deal of planning will be required if the levy passes. Several at the meeting discussed that having the Bennington Revitalization District will contribute to opportunities not only for hotels and restaurants, but for retail business, entertainment and jobs for the township and county.